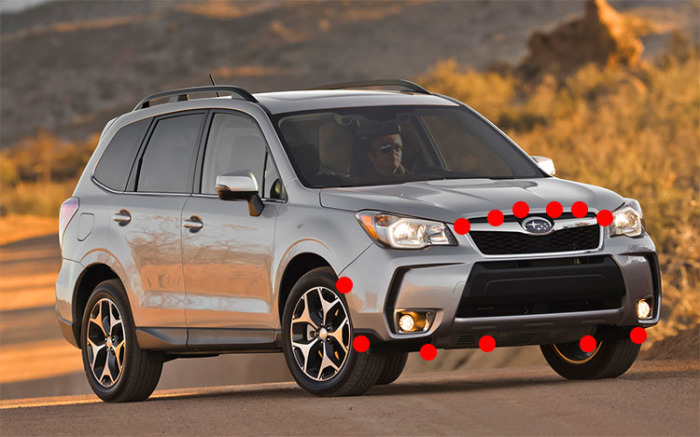 If you have A 2014 forester XT there will be 10 body clips holding in the front grill/intercooler ducting. The are in the following locations. I assume the normally aspirated version of the forester probably has 6 clips holding it in. Carefully use a flat head screw driver to separate the body clips at the designated pry-points. Next there are four hidden screw holding the grille on. You will need a very short Phillips screwdriver to get the bottom two out (the shorter the better). The top two are easier to get out with a long Phillips. Removing the body clips from the intercooler duct work will make your life much simpler to get at the bottom two screws (basically required). Once you have removed 10 body clips and 4 screws the lower section of the grille will pop out. There are four plastic tabs holding it on if they are stuck you may have to unlock them with you fingers by pushing out on them gently. The following image is not mine, but if you want to remove the bumper entirely the general location of the body clips are marked below. You will probably only need to remove this section if you are replacing your grille with a sport grill or you cracked your existing one. Remove the inner six 8mm nuts. Removing the lower two will likely make it easier to pry off the upper section. The outer most nuts hold the trip on along with two screws that are only visible once the upper grille section has been removed.